The aim of a soccer game is to score more goals than the opponent does. The chances of doing so increase when all the own players are continuously present on the field. 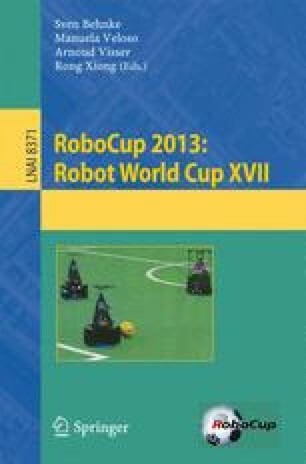 In the RoboCup Standard Platform League (SPL), the only reasons for players not to participate in a game are that they either have been penalized or they have not been ready for the match in the first place. This paper presents some of the methods the 2013 SPL world champion team B-Human uses to ensure a stable and continuous game performance. These include overcoming the weak obstacle avoidance of our 2012 system, reacting to a rule change by an improved detection of the field boundary, better support for analyzing games by logging images in real time, and quality management through procedures the human team members follow when participating in a competition. The authors would like to thank all B-Human team members for providing the software base for this work.